Cypheros Papywizard XML Toolbox Free Windows tool to create, merge, or correct XML files for gigapixel images. This makes it possible to merge two gigapixel images or correct the shifts created by the gear backlash of the gearbox in automatic stitching heads such as the Seitz Roundshot VR Drive. 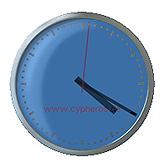 Free, small, transparent analog clock for the desktop. Starts automaticly and remembers the position and the transparency if wanted. Can stay in the foreground or in the background. Unfortunately, the Speedport W700V has no way to display the signal quality over time. This tool requests every second the parameters of the Speedport Router and displays them. This makes it possible to detect special receiving problems that only occur at certain times.